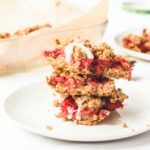 Chewy and crumbly vegan strawberry crumble cake bars – refined oil free, refined sugar free, and gluten free. Place all dry ingredients (rolled oats, almond flour, baking powder, cinnamon powder, and salt) in a mixing bowl and combine. Preheat oven to 350F. Add one cup of date paste to dry ingredients and combine until evenly mixed. To make date paste: add 6 pitted medjool dates and one cup of water to a blender and blend until smooth. Remove 2/3 of the crumbly oat/almond mixture (leaving about 1 cup aside for the topping), using your fingers press down the mixture onto the bottom of an 8×8 square glass dish or something similar until the bottom of the dish is covered entirely. I cover my glass dish with parchment paper to avoid the mixture from sticking to the dish since I don’t use oil to coat. Make the strawberry filling. Roughly slice up the strawberries into rounds (remove the green stems) and place sliced berries into a pan and cook over medium heat. Add agave (or maple syrup) and vanilla extract and gently mix in. Cook for around 7 to 10 minutes, until the strawberries have released their juices and are soft and slightly broken down. Be careful not to over-cook, or you’ll end up with very little filling because of reduction. Spread the filling over the oat/almond crumble mixture that you pressed into the glass dish, and finish it off by topping it with the left over crumble mixture that we set aside earlier. Bake at 350F for 40 minutes. Let cool down before serving. Cake will be extra crumbly while warm and fresh out of the oven. Once refrigerated it will set a bit more. Remember to line your baking dish with parchment paper to avoid the cake from sticking to the bottom of the dish. I prefer this recipe using the ‘date paste’ method (as written) but if you are in a pinch you can also use one cup of almond milk and 2 tablespoons of agave or maple syrup instead of date paste. You can use frozen strawberries for the filling if you do not have fresh available.